The Chamber is here to connect your business with visitors, residents, and other business members of the community. Together we can build a foundation that will help Richland County be stronger. Richland County is located at a central point where within a few hours you can reach Chicago, Indianapolis, St Louis, and evenKentucky & Tennessee. This is an advantage for shipping products and a wide customer base for a prime business location. The crossover of Route 50 and Route 130 brings travelers crossing the state through town. Richland County offers a variety of choices for your lifestyle. Rural homes offer acreage and quiet roads while within the city limits you are in walking distance to local parks, shopping and schools. For those looking to downsize there are apartments and small, low maintenance homes available. 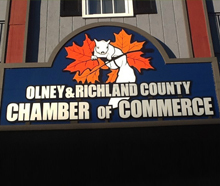 Olney and Richland County are home to an impressive number of physicians and specialists. Carle Richland Memorial Hospital,is a 134 bed, HFAP accredited facility, and currently serves eight Southeastern Illinois Counties, offering 24-hour emergency and ambulance services, in addition to a full complement of inpatient, outpatient, and home health care services. Olney and Richland County also offer a diverse selection of dentists, orthodontists, optometrists, and chiropractors, who are highly skilled and prepared to meet your individual needs. Olney prides itself as a senior friendly community, providing several housing and long-term care choices, in which seniors can spend their golden years with comfort and security. We are also fortunate to be home to an Air Evac Lifeteam Air base. Air Evac offers residents peace of mind that if an emergency arrises they can be flown to a trama unit in a matter of minutes, not hours. Educating those who are the future of the community is of the utmost importance in Richland County. To ensure success, Richland County Schools, St Joe Parish, East Orchard Christian Academy, Private Preschools and Illinois Eastern Community College (Olney Central College) work together to create an environment that is one of the finest in Southeastern Illinois. No matter what your hobby or interest we have it all right here. The activities are never ending as local volunteers step forward to develop many diverse opportunities. Performing Arts, Sports, 5K's, Visual Arts, Playgrounds, Disc Golf and so much more The 4-H Programs to the Olney Arts Council Showcase will show you the hard work of all ages. Stop by the calendar of events to just catch a glimpse of what is supported to help your talent shine. The sense of fellowship that results from having many active churches in the community is part of what makes Olney and Richland County such a rewarding place to live and raise a family. The spiritual influence goes far beyond the needs of individual residents, affecting the entire population and raising the quality of life in the area for everyone.